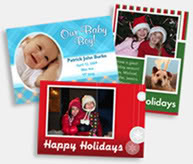 Centsible Savings: FREE photo cards offer still going! I have great news!! Remember the offer I posted here for 100 custom photo cards you could get for shipped to you for FREE? I was a little disappointed that I didn't get my tree up and a picture taken in time to take advantage of it. But I checked it today and THE OFFER IS STILL GOOD! You can now get 50 photo cards for FREE but you must pay shipping this time of $3.19 for all 50 cards. That is only $0.06 each! Great deal!! Go here to create an account at SeeHere. Then upload your photo and create a photo card. Make sure to save your card. Add 50 photo cards to your cart and checkout using coupon code "newbaby" to get all 50 FREE (just pay shipping of $3.19). I am reading that people are getting these cards in a week or less so you still have plenty of time to get them and mail them in time for Christmas. and I invite you to do the same. It`s all about how to choose a proper partner who uses your funds in a right way - that`s it!.